When I read the article that Belmar NJ mayor told his residents that Irene was not something to play chicken with I realized that playing chicken has no resemblance to true chicken behavior ( at least among the hens – maybe roosters do this?). And even if it did, it’s hard for me to believe our hens would play chicken with a hurricane. Since their avian AI barely lets them handle being out of the coop when Jason cleans it, it’s sort of like having to manage the chickeny and infirm. They don’t speak the language and they won’t know how to evacuate. Wikipedia provided a delightful tangent around “schedule chicken” which as a web program manager I have not practiced but could easily imagine the cluster-f that this political game would have on a product. 😛 But it seemed to indicate the use of chicken in the game label had more to do with perception of chickens as weak birds – the other label is “hawk-dove” which has higher drama factor but less cluck factor. Jury still out on that. But in reading all the Irene news, it’s clear – wherever the term originated, Mother Nature is not something to play chicken with. Having lived through Hurricane Andrew, Irene reminded me that temporary housing – mobile homes, pre-fab things, stuff without real foundations – is the most vulnerable and then after that it all depends on your location. In our case, though hurricanes are rare in Seattle (and I bet they thought that in NYC too!) the coop would definitely blow away or wash away, so we may have to follow the cats/dogs advice and bring them all inside. We’ve brought the chickens inside for illnesses of course though not all three at once, and admittedly structurally that bathroom is probably the safest in the house (though we would not want them pooping in the water in the bathtub durring a hurricane. During an earthquake, what we’d hope is the coop was far enough away from structures and the run tough enough to at least deflect some debris that might fall on them before we could get home from work and check on the chickens. 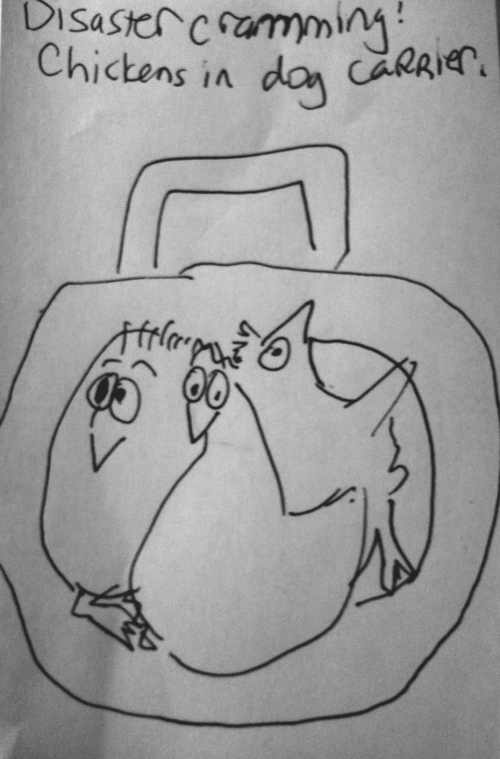 The other option of course is to head for the hills with a go bag or two and cats in cat carriers, chickens in chicken carrier (really a dog carrier). We always have an extra bag of feed in the shed, just as we have advance supplies of cat litter and food, but I admit chickens do not respect the sanctity of getting the rest room key at the gas station. We may need to think more about this.